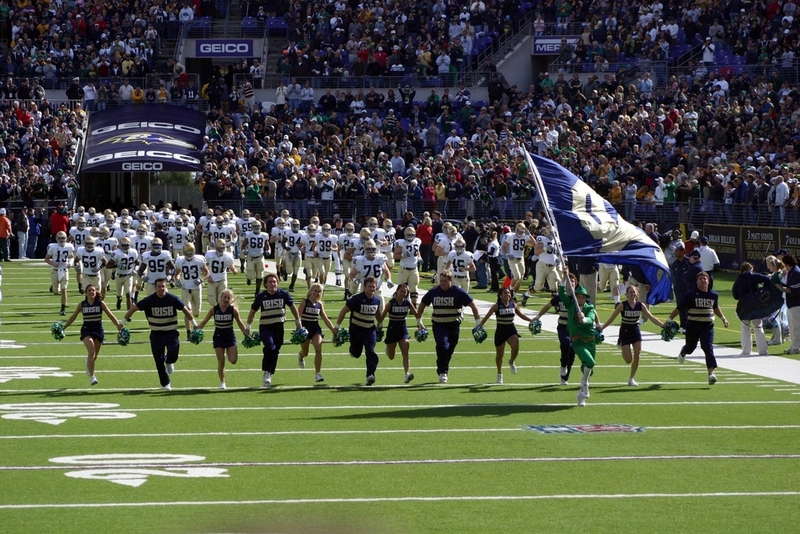 Why the French-Founded Notre Dame School's Athletic Teams are the "Fighting Irish"
Nathan K. asks: Why is Notre Dame’s slogan “Fighting Irish”? I came here as a young man and dreamed of building a great university in honor of Our Lady. But I built it too small, and she had to burn it to the ground to make the point. So, tomorrow, as soon as the bricks cool, we will rebuild it, bigger and better than ever. And they did rebuild, indeed making the school bigger and better than before as was vowed. Less than a decade later, in 1887, the athletic department even established a football team. The game of (American) football has its origins in rugby, first played in English public schools during the mid-19th century. The rules and how the game was played varied from place to place, but when the game made its way over to America, it developed into something a little different. Many historians believe that American football can be traced back to a game played between Rutgers University and Princeton in 1869. Using modified London Football Association rules, the game quickly took off among eastern colleges. In 1876, Walter Camp, a Yale grad and coach who would become known as the “Father of American Football,” proposed a line of scrimmage, as well as down and distance rules, forever separating it from rugby. The game expanded very quickly, gaining favor on the east coast all the way to the Midwest. In 1880, there were only eight universities that fielded collegiate football teams. By the turn of the century, there were 43. One of those was Notre Dame. It was not considered a match contest, as the home team had been organized only a few weeks, and the Michigan boys, the champions of the West, came more to instruct them in the points of the Rugby game than to win fresh laurels. Over the next twelve seasons, the Notre Dame football team compiled a 25-11-3 record against the other intercollegiate teams under the nickname the “Catholics.” Many of these other college teams they beat were also Catholic schools- Boston College, Fordham, and Holy Cross just to name a few. As opposed to Notre Dame’s French background, they were founded by, and intended for, recently immigrated Irish Catholics. The Irish Potato Famine of 1845 convinced many to make their way across the Atlantic to America. As they settled in eastern cities, they desired a place for, or at least to aspire to, a higher education. These colleges represented upward mobility and the ability for anyone to make it in America. As recent immigrants to this country, the view of the Irish were colored by pretty jingoistic views. They were known as drunks and “brutes,” while possessing a violent temper. Even future President Theodore Roosevelt, while a New York State Assembly Member, had some choice words to say about the Irish, “The average Catholic Irishman of the first generation, as represented in the Assembly [is a] low, venal, corrupt, and unintelligent brute.” To call someone Irish was to imply that they were uncivilized, violent, and un-American. In other words, it was an insult. So this brings us to the nickname. It seems that not even the University itself is exactly sure how this rather odd nickname came to be, though there are some popular theories and with the documented evidence at hand we can mostly piece together in general how it came to be. To start, one legend states it was 1899 when, during the second half of a game between Notre Dame and Northwestern with Notre Dame leading five to nothing in Evanston, Illinois, the fans started chanting “Kill the Fighting Irish, Kill the Fighting Irish.” Whether they failed to realize that Notre Dame was French Catholic or simply just didn’t care and were looking for a choice insult, it didn’t matter. The nickname supposedly stuck from there. Another story, albeit a much kinder representation of the nickname, goes that the name came from the Union Army’s Fighting Irish 69th Regiment. Part of the larger Irish Brigade, they fought with valor, bravery, and were brutally effective. They went into every battle with their colorfully designed green battle flag. Legend has it that when President Lincoln paid them a visit, he picked up a corner of the green Irish flag, kissed it, and said, “God bless the Irish flag.” So, when the press saw these Notre Dame football players play with toughness, courage, and assuming they were also Irish, the nickname that once belonged to the beloved 69th Regiment was given. Eleven Fighting Irishman wrecked the Yost machine this afternoon. Three sons of Erin, individually and collectively representing the University of Notre Dame, not only beat the Michigan team, but dashed some of Michigan’s greatest hopes and shattered Michigan’s fairest dreams. In the end, whether Batchelor really overheard such an exchange; came up with the nickname himself; or, perhaps more likely given he uses the nickname casually as if the reader should know exactly who he’s talking about, had heard it elsewhere, the generally accepted genesis of the name lies in the previously mentioned popular association between Catholics and the Irish. Given Notre Dame had around this time gone by the “Catholics,” among other monikers like the “Terriers,” (with an Irish Terrier during this time supposedly a staple on the sidelines), it’s perhaps not much of a leap to see how someone, perhaps Batchelor, perhaps not, could have made the jump to “Irish,” despite the school’s French origins and mixed heritage athletes. This is particularly the case if it was indeed initially meant as an insult, as it would seem. With the nickname firmly embraced, despite the negative connotations, soon, students, players, media, and even legendary coach Knute Rockne were calling their beloved team the “Fighting Irish.” Noted Notre Dame alumnus Francis Wallace also did his part in widely popularizing the moniker, commonly using it in his 1920s New York Daily News articles. With little choice and a nod to the complementary aspects of the nickname- referring to the athletes’ never say die spirit and scrappy determination- University President Rev. Matthew Walsh adopted “Fighting Irish” as Notre Dame’s official nickname in 1927. Michigan has beaten Notre Dame 24 out of the 41 times they’ve played (with one game ending in a tie) over the 126 seasons they’ve both had football teams. Why so few in such a large number of years? After playing in 1909, Michigan protested Notre Dame’s use of two players who they deemed as “ineligible” and told other Midwest schools not to schedule them. Notre Dame and Michigan didn’t play again until 1942. They played only two times before taking another hiatus until 1977. The two schools competed in other sports during that mid-20th century hiatus, but not in football. The two football clubs have played every year since. Besides Batchelor calling the Fighting Irish the “sons of Erin,” the 5th Missouri Infantry fighting on the Confederate side during the American Civil War were also called by this name. Besides that, they were also known as “Kelly’s Irish Brigade,” after Colonel Joseph Kelly. Montreal’s new saint, Brother André (founder in 1904 of St. Joseph’s Oratory), was a member of the same religious order. The place where he worked as doorman for 30 years (which still exists) is called Collège Notre-Dame. Note that in the mid 1930s, local bigots tried to bully Notre Dame out of existence. They failed. The University students turned out to indeed be Fighting Irish.